I’ve worn blush pink with this leopard coat before, and it’s a really nice combination I think – something about the contrast of wild animal print and the softest of pinks appeals to me. 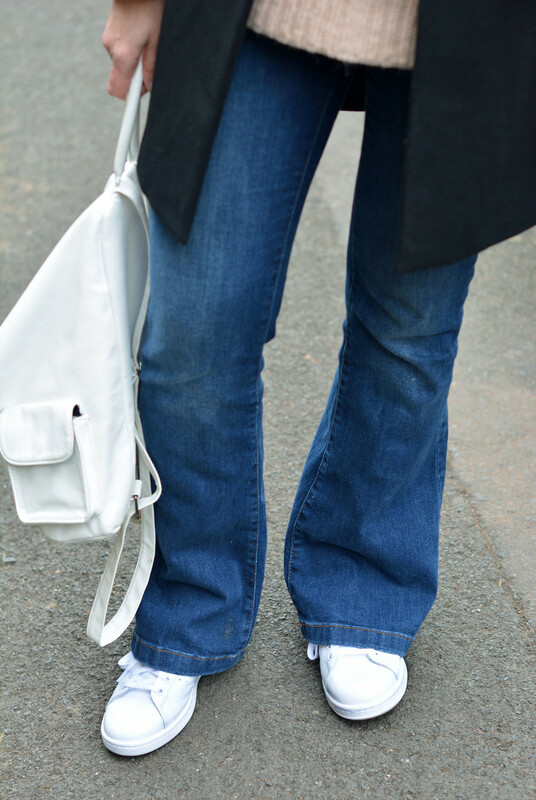 The flared jeans and white Adidas Stan Smiths are so comfy I think I may be hard pressed to wear anything else till this weather cheers up a bit – could someone please tell Mother Nature to turn the thermostat up a bit…?! I’VE WORN BLUSH PINK WITH THIS LEOPARD COAT BEFORE – SOMETHING ABOUT THE CONTRAST OF WILD ANIMAL PRINT AND THE SOFTEST OF PINKS APPEALS TO ME. I wore this outfit for an early morning in the cold watching (and cheering on) my sister and niece run a local 10k race – I would normally have been running it myself but I haven’t done enough running post-injury to be able to run a 10k… My fitness levels just aren’t quite there yet. You can read up on my back to fitness progress with my #notlambFIT series: This weekend I posted some great healthy breakfast recipes (all of them wheat-free and high in protein) that I’m sure you’ll love! 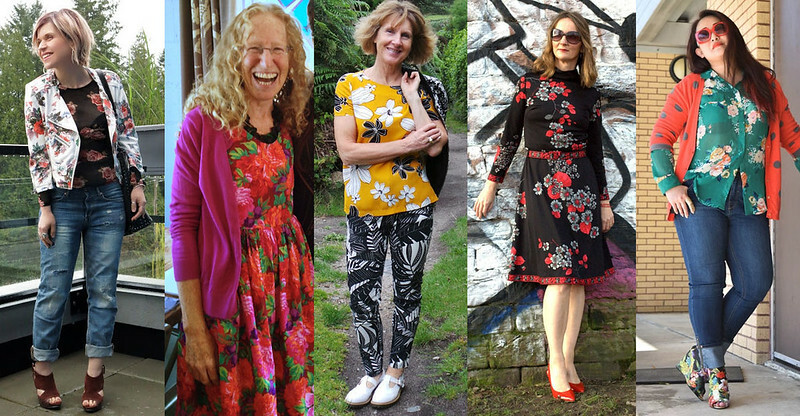 And of course do add your outfits to this week’s link up – no theme so everyone has an equal chance of being featured next week (only if you’ve added a link or my button though of course)! 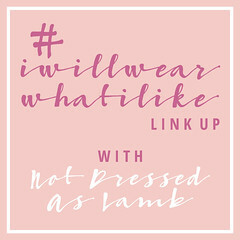 WHAT HAVE YOU BEEN WEARING AND LINKING UP THIS WEEK? TELL ME BELOW IN THE COMMENTS, OR TAKE IT TO TWITTER @NOTLAMB! To get yourself featured next week, make sure you’ve included a link back to Not Dressed As Lamb or my button in your post/sidebar – I’ll simply be picking my favourites as there’s no theme this week! This combo looks so fresh and fun! Thanks so much for linking up with Fun Fashion Friday, Gorgeous! We're having the same kind of weather so your outfit looks just like what I want to put on. I'm loving the white addidas, I believe they will be my go-to shoe for the season. Loving your outfit!! It really looks good! Thanks for sharing this blog! I do like the two toned coat on you styled with the adidas, almost like a cool girl don't care vibe. So loving the versatility and edginess of the two toned coat – Hope you had a lovely Easter! I collect vintage leopard coats and I just can't seem to get enough of them. Love that you put yours with the soft pink, two of my favorite things! Thank you for hosting Kathrine!! You look very comfortable and sporty. I really love that leopard coat. I love the soft pink with the animal print as well. March is so fickle. Thanks for the link-up, Catherine. Love the two tone coat. Last week we had a blizzard. Today it is raining. Gotta love March in Canada. You + leopard print = a match made in heaven! Our weather is all over the place as well…but on the bright side, that fabulous coat deserved at least one more outing before warm weather gets here and decides to stick around! I love leopard print when made well, and this coat is that and more. Love the bush tones and so fun wearing with white sneakers. I wore slip ons last week with bf jeans and get in the mood for it. The soft pink is a lovely blend with the leopard. Hope you had a wonderful Easter. Thank you for hosting the link-up lovely lady. Great coat! It looks great with the pink sweater! I also love the flares with the sneakers! I only have one pair of flares that work with (quite high) heels, but I really want another pair that'll work with sneakers/flats. Dear Catherine I haven´t been close to a coat since we are living here. I only own one, plus many light jacket and a thick jacket for England,hahahha. We might come over this summer. Thank you so much for your gorgeouness and lovely link up. That coat is quite a statement!! I love it with the blush (I almost thought it was a warm tan from the pictures)! OK that backpack is FANTASTIC! Love the simple silhouette with this knit fur combo — the perfect minimalistic touch to those fabulous layers! Lovin' the leopard print on you! I always enjoy wearing casual and comfy!